From blockbuster workout experiences to entirely new types of participants, Jak Phillips explores how next-generation virtual fitness is transforming the market and what clubs can do to stay ahead of the curve. Virtual fitness solutions – group workouts played on a screen – have enjoyed significant growth in recent years. Now estimated to be present in more than 12,000 health clubs worldwide, virtual remains in high demand as operators embrace the potential of digital solutions to enhance their value proposition to members. 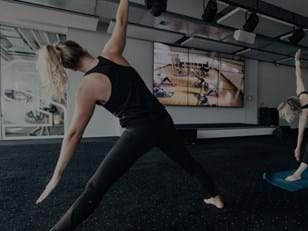 Bolstering timetables and boosting RoI on studio spaces were two of the immediate selling points of virtual fitness when it first came to prominence. 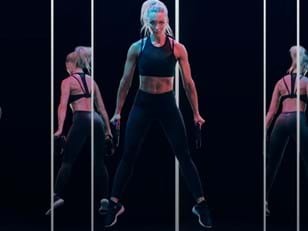 But as adoption across clubs grows, increasingly sophisticated solutions like LES MILLS™ Virtual are reshaping consumer habits and ushering in the next generation of virtual. “Virtual exercise has experienced an exponential increase – but members’ needs are continually changing,” says Les Mills CEO Phillip Mills. In a world of ‘what next?’ it seems consumers are demanding more from their clubs and faster. So what does this mean for the future of group exercise in health clubs? Here, we explore four ways virtual fitness is disrupting group exercise in health clubs, bringing a raft of opportunity for clubs, members and instructors alike. Virtual fitness is the future for health clubs. But that doesn’t mean live classes are the past and they remain the pinnacle group exercise experience. Clubs that combine the two effectively are yielding surprising results, with virtual classes actually helping to increase the number of people attending live classes. Industry research shows that 75% of virtual fitness users also attend live classes, while there’s a 12% average increase in live class attendance when clubs run virtual workouts and live workouts together. It seems virtual is serving as a gateway for people suffering “gymtimidation” by allowing them to dip their toe into the water of group fitness before taking the plunge with a live class. The solution is also proving a big draw for hard-to-reach younger markets, with millennials making up more than 30% of virtual users, according to industry research. “Virtual helps get people started with classes who otherwise never would, and many of them get hooked and go on to attend live classes,” says David Patchell-Evans, Founder & CEO Good Life Health Clubs. In today’s ‘always-on’ economy, consumers expect the choice of what they want and when they want it. Virtual is helping to fuel this sentiment among club members – over 70% of virtual users say they’re drawn by the flexibility to do a workout whenever it suits them. As a result, virtual is opening up group exercise to entirely new audiences. For the first time ever, off-peak audiences like shift workers can experience group fitness whatever time of day it is. "Les Mills Virtual has a big appeal for shift workers wanting to do RPM™ BODYPUMP™ and BODYCOMBAT™,” says Darren Saul, Managing Director at Benefitness & Health Centre Fairview Park South Australia. “We found that a lot of people just didn’t have the time to attend the usual live classes but can fit in a late Saturday or Sunday afternoon class." With great expectations come great opportunities, and clubs that meet this growing demand for choice are reaping the rewards. While boutique studios have earned success by focusing on singular products, traditional health clubs have been able to add value for members by broadening their offering. In the UK, David Lloyd Southampton was able to add an extra 200 classes through Les Mills Virtual, taking its total offering to 340 classes per week. This has gained the club an additional 400 class attendances each week and a notable impact on retention. “Virtual has been a real game-changer at Southampton as we no longer have class cancellations and can offer new and different programs,” says Elaine Denton, David Lloyd Group Health and Fitness Support Manager. It’s a well-known fact that empty studios are a drain on RoI. The average health club cycle studio stays idle for 83% of the day, according to Mintel (2017), and this can mean up to $160,000 per year of lost revenue. Virtual is an ideal solution to help clubs sweat their studio assets and lighten the load on peak periods by offering more workout options across the day. “We were very eager to get our hands on the new virtual solution offered by Les Mills so we could make better use of our studios – especially our cycling one – and grow our level of usage,” says Michael Blick of AquaLoft Fitness Club in France. What’s more, providing an ‘always-on’ group exercise timetable is a great way to attract new members. A massive 6/10 members stating that the number of GX classes (both live & virtual) their gym offers has influenced their decision to join. “When you tell potential members that you have a class for them no matter what time of day they come in, we find it’s a powerful reason for them to say yes to a membership,” adds Carrie Kepple, Manager at Les Mills Newmarket in New Zealand. Perhaps the greatest testament to the impact of virtual fitness is the fact that it’s starting to disrupt its own market segment. As adoption in clubs increases and we enter the next generation of virtual fitness, the quality of content will be the biggest determiner of success for a club’s virtual solution. Members’ expectations are increasing as quickly as technology evolves; meaning that for virtual, the experience is everything. Les Mills Virtual classes are exciting, cinematic-quality versions of live classes. You get chart-topping music and instruction from the world’s best talent – creating unparalleled virtual experiences. This, combined with the lighting and sound in a studio mean you are getting as close to a live experience as possible. Classes are updated quarterly to stay fresh and there’s a wide range of Les Mills programs to ensure you have plenty to choose from. HOW YOUR CLUB CAN DO IT?